Marked as Ontario’s top developmental league to the professional level, League1 Ontario’s Young Player of the Year award shines the spotlight on players with a bright future on the pitch. 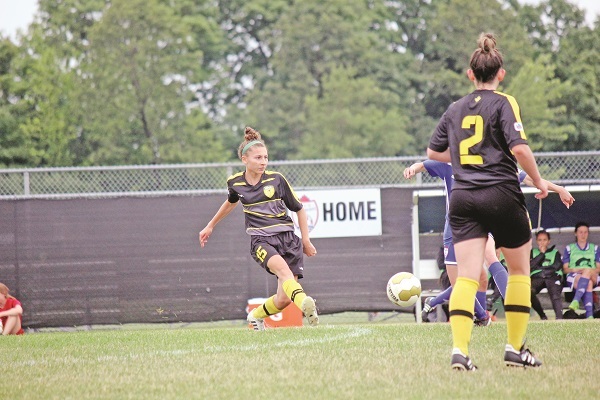 This year’s recipient may represent Albania on the international pitch, but she has called Aurora home in a breakout season this year with the Aurora FC club. Joining the squad at just sixteen years of age, Markela Bejleri caught the eye of scouts early in her first year of semi-professional soccer. The captain said it was her “physicality and mentality” that has brought her success, while her assistant coach Marc Hamilton echoed her words. With a pair of goals in nine appearances with the Aurora club, Bejleri led her team in scoring in the 2018 season, highlighted by a call-up to the Albanian National squad, and a number of appearances on the Under-19 Albanian side. The midfielder follows in the footsteps of fellow Aurora alum Sarah Stratigakis, who won the Young Player of the Year award in the 2016 season. She has already declared her intentions to join Quinnipac University in the NCAA Division I program, a decision she finalized just last week. Vaughan Soccer Club’s Dylan Sacramento was named the league’s Most Valuable Player.